On Wednesday night I was proud to join hundreds of residents from River Rouge and other Michigan communities in speaking out for cleaner air in Detroit. For decades, the residents of River Rouge and surrounding communities have been living with severe air pollution from nearby coal plants, and together, they came out in force to pack a public hearing and call on the Michigan Department of Environmental Quality (MDEQ) to put a plan in place that will finally clean up this pollution and correct a longstanding environmental injustice. Detroit is home to some of the most polluting coal plants in the country, which are major contributors to significant health problems in Wayne County. In fact, the River Rouge coal plant was listed as one of the nation's top environmental justice offenders by the NAACP in their "Coal Blooded" report. Exposure to sulfur dioxide pollution -- which comes from coal plants -- is a known trigger of both short-term health emergencies, like asthma attacks, and long-term, chronic health problems. "It's not right to let big corporate polluters dirty our air for so long and threaten the health of our families," said Ebony Elmore, a childcare provider and activist in River Rouge. "We deserve safe air to breathe. This is a basic human right and MDEQ isn't protecting us." Asthma rates in Wayne County are through the roof -- the statistics will shock you: According to recent studies, the county has the highest number of pediatric asthma cases in Michigan. Asthma hospitalization rates are three to six times higher than the state as a whole. The prevalence of asthma among Detroit adults is 50 percent higher than the rest of Michigan. At Wednesday's rally and hearing I heard person after person tell stories about asthma and respiratory problems from the bad air quality in the area. These families have lost loved ones to respiratory illnesses. One man described comforting the mother of an 11-year-old who died from asthma. Another young woman who grew up in the shadow of a coal plant described childhood soccer games where asthma attacks were so frequent that her teammates were regularly taken away by ambulance. It was heart-wrenching. The Environmental Protection Agency (EPA) has determined Wayne County has chronic, dangerous levels of sulfur dioxide pollution. And Detroit-based DTE Energy's coal plants are responsible for a whopping 85 percent of all sulfur dioxide emissions in Wayne County. That means cleaning up this pollution would go a long way towards improving public health in these communities. 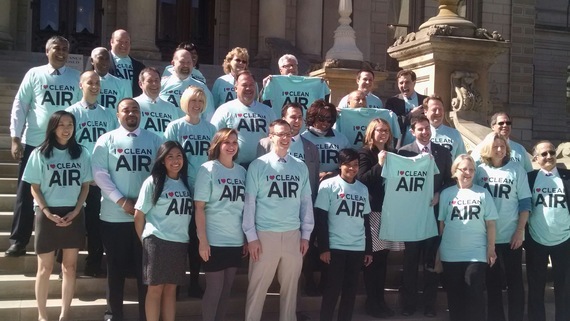 The state of Michigan is now required to put a plan in place to reduce this dangerous air pollution by 2015. As part of its plan to clean up sulfur dioxide emissions in Wayne County, the state must hold DTE responsible for its major contribution to health impacts. The state must require DTE to prevent its emissions from exceeding health standards, by either installing best-performing pollution controls or by ceasing burning coal, which is the source of these dangerous pollutants. This is all very possible. I have seen city after city make the decision to phase out an outdated, polluting coal plant as a result of tenacious grassroots campaigns launched by local residents. From Chicago to Indianapolis, from North Omaha to Alexandria, Virginia, just across the Potomac from Washington, D.C., local residents have won campaigns to phase out the coal plants that were contributing to sky-high asthma rates and other local health problems. Electricity rates have stayed low, and the lights have stayed on, thanks to cheap, clean alternatives like wind and solar and energy efficiency. If MDEQ doesn't put a plan in place to clean up this pollution, the Sierra Club will continue to join our partners and friends in River Rouge and across the region to fight for clean air by calling on EPA to put a federal plan in place that will do the job. We aren't going to stop until the air is safe and the kids and families of Wayne County no longer have to fight for the right to breathe.